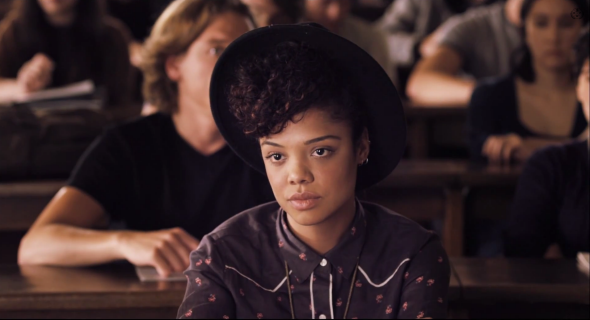 Last year’s Sundance Film Festival played host to some stellar debut films, but none provoked discussion like Justin Simien’s first feature, “Dear White People.” Based off of the concept trailer that he put together to secure crowdsourced funding (the project was Indiewire’s Project of the Year in 2013), “Dear White People” is a freewheeling ensemble piece set at a fictional Ivy League college that explores racial identity in Obama’s America. It centers on how four black students each react when they learn of a planned “African American” themed party, thrown by white students. Indiewire spoke with Simien, who used to work in film publicity before becoming a filmmaker, about the comedy’s message, and what he has planned next. I’ve been working in publicity and marketing for some years, so [for the “Dear White People” pitch trailer] I just relied on my instincts in terms of what would the trailer for this be, if I could have it be anything. It was really important for it to feel like it was a real movie so people could have that letdown that it could never be a movie unless people supported it. That was the goal. I thought this was a movie about identity so it was important for me to present the world of the story as beautiful, as beautiful as a box that ultimately becomes too confining for the characters. I wanted the film to take place in a presentational, theatrical world that you can only really do in the movies. The movie is very aware that it’s a movie. It’s making references to other filmmakers. I wanted to be a filmmaker since I was a kid. I always did things that took me a little closer to that. I took an internship at Focus Features while I was in film school. I was really interested in how specialty movies were marketed and found their audience, despite being about topics that were outside of the mainstream. That internship turned into a job offer, and [taking it] was part of just paying the rent, to be honest. I took to the social politics of working in publicity. It also really informed the way we were able to get attention for this film. There was so much hype from this concept trailer that the story could have been everybody saw it but it didn’t live up to expectations because of the concept trailer. Every time something amazing happens to our film — I just got word that some screenings have already sold out — it does take me by surprise. I don’t trust that anything will work out the best way, so every time it does it takes me a while to catch up to it. I know that race politics are going to be on the minds of people after they see the film. But I really hope people begin to talk about the film as just a film. It’s one that’s certainly is told through a black lens, but is talking about something that’s more so the human condition. I have a great love for film and for story. I don’t see my film as a piece of propaganda or as a political rallying cry. I see it as a film about these four kids. If the film is a commercial success, it really will sort of open the doors for new and interesting filmmakers to come through, and give us more stories that feel true to the American experience. I feel that the America in Hollywood and in movies still does not look actually like the America we live in. The more it does, the more I’ll enjoy going to the movies. I don’t have a lot of interest in doing something that’s straightforward. As a filmmaker, I find it hard to get it up for a story that’s meant for an audience to come in and turn their brain off. That doesn’t interest me. I think I’ll always be making movies that intend to say something new. It would be very difficult to imagine pouring any passion for something that only really wants to be entertaining. I’m working on my next original screenplay right now. And ultimately I would really love to see “Dear White People” make it to television. Those are the things I got on my plate.